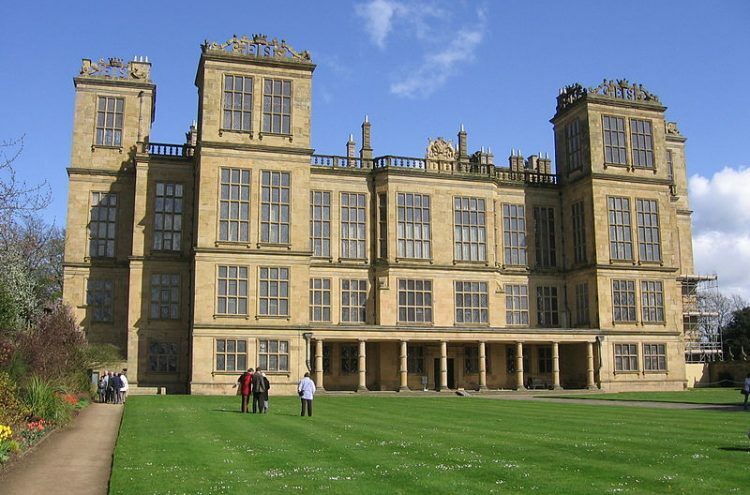 Located in Derbyshire, Hardwick Hall was built between 1590–1597 for the formidable Bess of Hardwick. We are organising a day trip to the hall in July. The trip has been planned to complement the Special Interest Day, Bess of Hardwick and her descendants, which was held in February 2014. Hardwick Hall is perhaps the most perfect of all Elizabethan houses. It was designed by Robert Smythson, a mason by training but one of the first Englishmen to be described as an ‘architect’. As you climb the hill towards Hardwick, one of the first things you see are the tops of the towers bearing the silhouetted initials ‘ES’ for Elizabeth, Countess of Shresbury, better known as Bess of Hardwick. Bess and the house she built are inseparable. She was born at the Old Hall in about 1527, and it was to here that she returned in her sixties, a wealthy widow after four judicious marriages and six children. She built Hardwick New Hall next to the Old Hall, a proud memorial to celebrate her rise from an obscure gentry family to the rank of Countess. Hardwick has height and symmetry, six towers and a huge expanse of window glass. Uniquely among Elizabethan houses, Hardwick retains the textures of its original decoration – huge Flemish tapestries, Persian table-carpets, painted wall hangings. coloured plaster friezes, inlaid furniture, rows of portraits, and the finest collection of 16th and early 17th Century needlework. Critics conclude in excitement and romance there is no Elizabethan house in England to rival Hardwick. Hardwick Old Hall, which was completed in 1591 is now a ruin in the grounds of the New Hall. Bess transformed her birthplace from a modest medieval manor house into this luxurious Elizabethan mansion. Although the Old Hall is now roofless, you can still ascend through the fours storeys to see decorative plasterwork and overmantels in former staterooms. An exhibition on the ground floor describes the architecture and there is a virtual tour of the first floor rooms . After visiting Hardwick New Hall you may have time to see the New Hall. If you visit the Old Hall, National Trust members are admitted free with a charge of £4.40 for non-members. This will be a long day. Unfortunately, there is nowhere available to stop on our journey to Hardwick. We will not be stopping for coffee or a comfort break but a toilet is available on the coach. Flat comfortable shoes are essential. There are many stone stairs to the upper levels of the house. You can purchase drinks at the Coach House kiosk, and drinks and meals at the Great Barn Restaurant on arrival. It will be busy so you may want to take a packed lunch – picnic tables are available. At 4.00 pm, after having explored the house and grounds, you will make your way back to the Great Barn Restaurant where tea/coffee and cake will be provided before our departure at 4.45 pm.